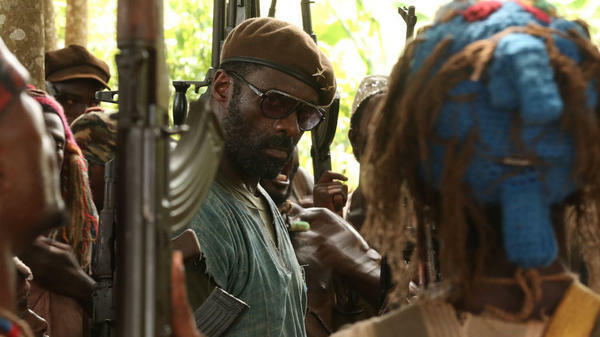 Idris Elba stars as an African warlord in the forthcoming film Beasts of No Nation. Netflix recently purchased distribution rights for the film for nearly $12 million. Beasts of No Nation is the story of a West African child who is forced to join a unit of mercenary fighters. Actor Idris Elba portrays a brutal warlord who recruits the child soldier. Director Cary Fukunaga, best known for his work on HBO's True Detective, adapted the script for this movie from a novel by a Nigerian author, Uzodinma Iweala, who took his title from a Fela Kuti album. But famous names and a literary pedigree aren't why the movie's been making headlines lately. This week, Netflix announced that it paid nearly $12 million for the worldwide distribution rights for the movie. The movie already has a lot of Oscar buzz, but to qualify for an Academy Award nomination, it has to be shown in theaters before or on the same day it plays on TV, online or other platforms. So the streaming service plans to release the film in theaters and online at the same time, an emerging strategy in the industry. But some major theater chains are not playing along: AMC, Regal, Cinemark and Carmike have refused to screen it. "Exhibitors are not being shy about saying 'No dice, we're not doing this,' " says Phil Contrino, the vice president and chief analyst for BoxOffice.com. He says the traditional distribution model protects box office profits. "If you value the theatrical experience and you want to protect it and you like to go see movies in theaters, this can't be chipped away at," he says. "Too much experimenting can lead to dangerous consumer expectations where they're gonna say, 'Well, I just expect movies to be at home right away, why do I have go to theaters to see that?' "
Not everyone is so torn up about what's called "day-and-date" strategy — that is, releasing a film online and in theaters simultaneously. Tim League runs the Alamo Drafthouse, an independent chain with 19 theaters in Texas, New York and soon, California. He plans to run Beasts of No Nation even while it streams online. "I don't want to be perceived as some sort of heretic within the industry," League says. "I'm just trying to be reasonable about the idea that releasing independent films is really hard and it's not that profitable. [Movies] about child soldiers in Africa aren't the movies taking in millions. It's a niche community. And if these kinds of films can be successful, I love being part of the equation. I'm not trying to rock the giant boat of overall release strategy window-changing in the U.S."
League says the day-and-date strategy doesn't make sense for big movies like The Avengers or the upcoming Star Wars. But he says the approach worked well with the sci-fi movie Snowpiercer, released last summer. The post-apocalyptic film ended up grossing $4.6 million theatrically and more than $8.6 million through video on demand, says Tom Quinn, the co-president of Radius-TWC, the boutique label of the Weinstein Company. He says for the past six years, his company has successfully released its films on many platforms as well as in theaters. "We're agnostic. We're screen-agnostic," Quinn says. "You know, a screen is a screen is a screen, whether it's in a theater, whether it's at home on your TV or whether it's your iPad. Where you want to consume is where you want to consume and we wanna make it available to you where it makes sense for you, but we also want to build our films in a way that suits them. It's not a one size fits all." Netflix hasn't yet specified when Beasts of No Nation will be shown. Audiences will get to see it the way they want to — as long as they don't want to see it at the big movie theater chains. This week, Netflix announced that it had paid $12 million for the worldwide distribution rights for the movie "Beasts Of No Nation." Netflix plans to release the film online and in theaters at the same time. NPR's Mandalit del Barco reports some major theater chains are not playing along with the new strategy. MANADLIT DEL BARCO, BYLINE: The film "Beasts Of No Nation" is the story of a West African child forced to join a unit of mercenary fighters. Actor Idris Elba portrays a brutal warlord who recruits the child soldier. Director Cary Fukunaga, best known for his work on TVs "True Detective," adapted the script for this movie from a novel by a Nigerian writer who took his title from a Fela Kuti album. DEL BARCO: The movie already has a lot of Oscar buzz. But in order to qualify for an Academy Award nomination, it has to be shown in theaters before or on the same day it plays on TV, online or other platforms. Netflix plans to release "Beasts Of No Nation" in theaters and online simultaneously, but theater chains AMC, Regal, Cinemark and Carmike have refused to screen it. PHIL CONTRINO: Exhibitors are not being shy about saying no dice, we're not doing this. DEL BARCO: Phil Contrino is vice president and chief analyst for boxoffice.com. He says the traditional distribution model protects box office profits. CONTRINO: If you value the theatrical experience and you want to protect it and you like to go see movies in theaters, this can't be chipped away at. Too much experimenting can lead to dangerous consumer expectations, where they're going to say, you know, I just expect movies to be at home right away. Why do I have to go to the theaters to see that? DEL BARCO: Not everyone is so torn up about what's called day-in-date strategy - that is releasing a film online and in theaters simultaneously. Tim League runs the Alamo Drafthouse, an independent chain with 19 theaters in Texas, New York and soon California. He plans to run "Beasts Of No Nation" even while it streams online. TIM LEAGUE: You know, I don't want to be perceived as some sort of heretic within the industry. I'm just trying to be reasonable about the idea that releasing independent films is really hard and it's not that profitable. You know, movies about child soldiers in Africa aren't the movies that are taking down millions and millions of dollars. It's a niche community. And if these films can be successful, I love being a part of that equation. But I'm not trying to rock the giant boat of overall release strategy windows changing in the U.S.
DEL BARCO: League says the day-in-date strategy doesn't make sense for big movies like "The Avengers" or upcoming "Star Wars." But he says the approach worked out well with last summer's sci-fi films "Snowpiercer." CHRIS EVANS: (As Curtis) You take the engine and we control the world. JAMIE BELL: (As Edgar) When is the time? DEL BARCO: The post-apocalyptic "Snowpiercer" ended up grossing $4.6 million theatrically and more than $8.6 million through video-on-demand, says Tom Quinn, the co-president of Radius, the boutique label of the Weinstein Company. He says for the past six years, his company has successfully released its films on many platforms as well as in theaters. TOM QUINN: You know, we're agnostic, we're screen agnostic. You know, a screen is a screen is a screen, whether it's in a theater, whether it's at home on your TV or whether it's your iPad. Where you want to consume is where you want to consume. And we want to make it available to you where it makes sense for you. But we also want to build our films in a way that suits them. It's not a one-size-fits-all. DEL BARCO: Netflix hasn't yet specified when "Beasts Of No Nation" will be shown. Audiences will get to see it the way they want to, not just at the movie theater. Mandalit del Barco, NPR News. Transcript provided by NPR, Copyright NPR.